From the Trenches: Managing and building Data Science Teams? Abstract: Managing Data Science and/or Data Analytics teams poses some very unique challenges when compared to managing almost any other kinds of teams. This is not your typical software development teams though it certainly requires those software engineering principles. It's a truly diverse cross-functional team from varied backgrounds like Statistics, Physics, Software Engineering, strong business domain knowledge to name a few. Add to that, how do you promote, rate and challenge the team to succeed? And even more importantly what should the leadership of these Data Science/Data Analytics team look like? There really is no typical well-defined path to any of it as the field is still in it's primordial stage of morphing and growing up in many ways. In a way, it's a lot more challenging as some deep diverse skill-sets come into play with some really unique challenges unlike any other field. This session provides you with some stories from the trenches having adopted multiple approaches and with no one clear path but choices you will have to make in your particular case. 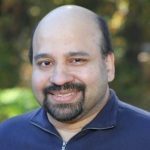 Bio: Kishore currently leads a Data Analytics team at Adobe comprising of Computer/Data Scientists, Data Engineers and User Analytics Managers. Prior to that he was the Director of Analytics at a startup called Sonian, managed Mobile and Analytics related teams at edX and Staples eCommerce division. Kishore has worked for over 20 years in various technical and leadership roles across engineering organizations at both startups and large enterprises. He has a BS in Electrical Engineering, MS in Computer Science, and an MBA with various innovation driven executive certificates. His current passion is in using Data-driven Analytics thinking in driving strategic changes and business initiatives through clear, compelling visualizations.